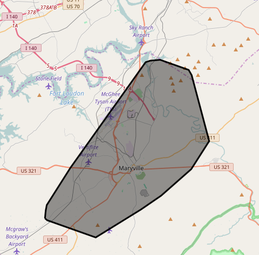 While the City of Maryville's residents enjoy quality power service, severe weather, fallen trees, and unexpected issues can cause power outages in the system. There are also times when maintenance requires a scheduled power outage. The following is how to respond when an outage affects your home or business. Check to make sure you have no billing issues and check your breakers. If everything should be working, call the Automated Outage Line 865-983-8722 to report your outage. The system will prompt you through the information needed to report the outage. If the system does not recognize your phone number, you can enter your Meter Number (found on your electrical meter box) or your Location number (located on your billing statement). If you do not have these numbers, you will also be able to leave a message with the automated system. Our dispatchers will receive the message and follow up. While on the line, you can request a call back when the outage is restored. ​After an outage is reported, you can call the outage number again for updates. You can also check the outage management map for more information. Click the map icon below to find out if an outage has been confirmed in your area* - and for more information as it becomes available. *The outage map will only report confirmed outages - which is often after a crew reaches the outage location and confirms through dispatch. You may not see your outage on the map even though it is in the system. Update your current phone number by calling customer service at (865) 273-3456 between 8 a.m. and 4:30 p.m Monday through Friday. The system can recognize up to three phone numbers per account. Be sure to add the mobile phone numbers to your account that are likely to call during an outage - especially if you have a land line that is electricity dependent. Businesses with multiple employees should post meter and location numbers in offices and break areas. Employees who call in outages can then refer to this posted information when asked for it while reporting your outage. Due to the fact that outages are often unavoidable and the lengths of them are often unknown, it is very important to be prepared. ALWAYS keep emergency supplies on hand such as batteries, flashlights, etc. Be sure to have either a land line or a cell phone available somewhere in your home. Stay away from any lines that are down or any situation that looks dangerous. If a power outage would cause a life threatening or any other serious emergency situation, please have all back ups necessary ready and available for use. If a power outage affects communications from the City - we will use the outlets that are available to us to help inform the community of power status.